Many of you know that due to our poor economy our cabinet business has taken quite a hit...it is barely hanging in there...in an effort to try and save it we decided to sell our home and move into a rental. Thus the reason for very few blog posts lately. Our new landlords are good friends of ours and they encouraged us to make whatever improvements we wished to make...good news :) The move is finally over...tomorrow I put the finishing touches on cleaning up the "old house" and hanging the last pictures in the "new house". I'm back to business as usual on Monday. Whew. The other good news is that even though our rental is smaller I ended up with a primo sewing room! The ceilings in this house are higher which gives me the illusion of more room...I have this amazing arched window that has a beautiful mature maple tree in front of it. Since my husband is a cabinet maker one of the perks is if I whine enough I get some cool things in my sewing room. While I was away on my last teaching engagement he built and installed two fabulous counter tops which gives me oodles of room for class prep. We moved the existing island from the old house to the new house so I have good workspace in the middle of my room. I also moved over the design wall. I painted some peg board and Kent hung it for me next to my sewing machine. 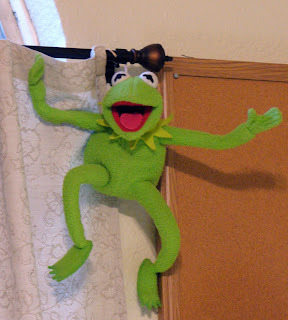 I am using this to hang all of my threads. 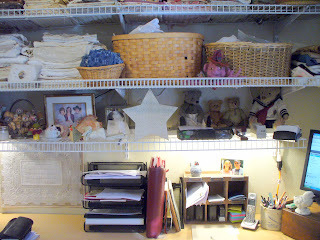 I used regular peg board hooks and put my thread on thread racks made by June Tailor...I bought mine from Joann's. It's almost like having a rainbow on my wall! 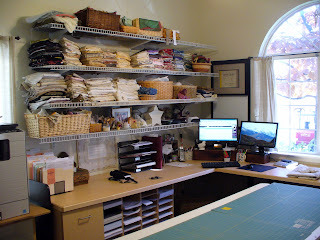 I used those wire shelves you can get from most hardware stores to hold my fabric and linens. I had three halogen strip lights used for under cabinet lighting and used these to provide light over my work space. One of the really cool perks to this room is it had a U-shaped closet at the end. I took off the door and added additional wire shelving. For the first time ever I have ALL of my supplies in one room. Things aren't scattered in three different rooms and into the garage. And speaking of the garage...we were able to re-use the countertop from my old sewing room and installed it in the garage next to the washer/dryer. I added wire shelving above this. This will be my new staging area for packing and unpacking suitcases from my travels. Everything travel related will be in one spot. Very cool. I'm sharing all the details of my new room with the thought it may help some of you with your own sewing rooms. I've received many emails from readers and friends sharing their concerns over our "life change". Kent and I are doing fine. When you are faced with a new challenge you must look at it as a positive...not a negative. I've learned how to take a few steps back and survey a situation and try and understand why things happen the way they do. We have been blessed with a nice, safe home in a great neighborhood...owned by old friends of ours. We have free reign to make it our home with any improvements we wish to make :) I have been blessed with an amazing sewing room that will allow me to be more efficient and organized for a very busy upcoming year of teaching and traveling. We have been given a positive opportunity to save our cabinet business which has been in existence for 30+ years. We have been blessed with an amazing network of family and friends...very cool. All best wishes for your future in your new nest. Your sewing room is lovely. Wishing you and your husband well in your new surroundings! Your positive spirit shines through, thanks for sharing that, I am looking forward to more posts from your wonderfully laid out and super organized sewing room. 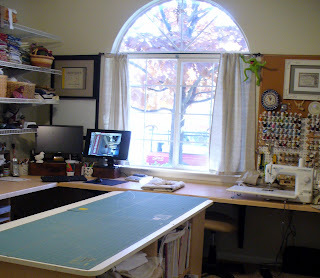 I'm admiring the view of your sewing room -- and that great window! Wow! And I never knew one could install so much in a rental property...you must have a very kind landlord. Best wishes for happiness in your new digs, and may your hubby get more work soon. I wish you all the best in your new home because that's what it is. Your sewing room is magnificent and you are so lucky to have a husband who's a carpenter and can make all those awesome things for you. I really hope things improve for him soon. What an awesome sewing space! And what a treat to be so organized and have everything all in one room. I just know you will create beautiful linens in that room. The window is divine! Cindy-best wishes for your future and hope the economy turns around soon to make a difference in your business. Attitude can make all the difference in the world and it sounds like you and your husband's attitudes are wonderful. Keep your chin up and keep doing that wonderful quilting that you do. Hi Cindy! Your ability to see the positive side of the stuff life throws at you is one of the reasons I love you. I have been following your latest adventure with keen interest, as I may be making a similar move. I am so happy that your new nest is such a reflection of your spirit. Now you can really enjoy the holidays! Hey, Cindy. 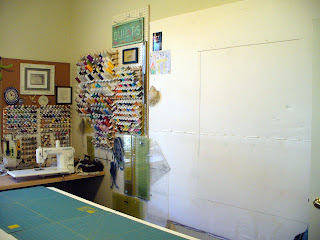 Perhaps until the cabinet business rebounds, your hubby could install dream quilting spaces! Great room, glad you have a great place to work!